Everybody experiences memory lapses from time to time. Those “What was it he told me?”, “I've forgotten”, “I can't for the life of me remember” moments are frustrating, but most of the time we know that occasional forgetfulness is normal, and not something to worry about. But, when memory lapses occur on a regular basis, interfere with your daily life, or loved-ones express concern, it could be time to consider that your forgetfulness goes beyond simple absentmindedness, and that your memory lapses may derive from other causes. 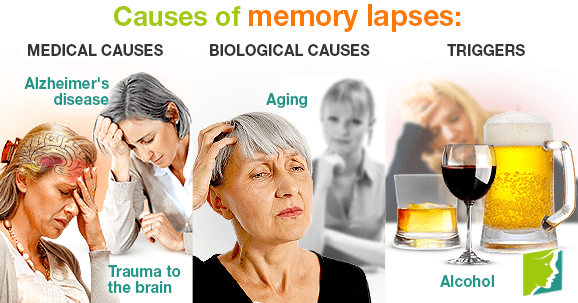 Some conditions, injuries, and other malfunctions in the body can causes momentary memory lapses occur. Trauma to the brain (i.e., after a car accident or a fall) can cause short-term memory loss, known as amnesia, where a patient struggles to process new information and retrieve memories from just before the injury. Amnesia may also occur in someone who has suffered a stroke. During a stroke, blood supply to the brain is cut off and this kills parts of the cells and tissues in the brain, which can affect memory. Depression and anxiety are conditions that cause tiredness and distraction. This is likely to affect concentration levels and thus inhibit the brain's ability to take in new information and result in memory lapses. Arguably the most feared cause of memory loss is Alzheimer's disease, which is a form of dementia. Early symptoms include forgetfulness; the patient may become lost on familiar routes, lose things, and experience difficulty performing tasks which require thought, but were previously achievable, such as playing a card game or understanding a new routine. Social memory is also affected when decreased awareness results in socially inappropriate behavior. Memory loss becomes more severe as dementia develops, and in extreme cases the patient struggles to remember words, recognize loved-ones, places, and objects, and forgetting how to recognize basic bodily functions, such as the need to swallow or urinate. Many people are quick to jump to the conclusion that their memory lapses may be early indicators of dementia - it's important to remember that there could be a multitude of other, less impairing causes. Aging brings with it a natural increase in memory lapses, but these are particularly common in women approaching menopause. The hormone estrogen activates neurotransmitters in the brain that influence memory and increases blood flow to the brain, which sharpens awareness and the ability to process, store, and retrieve new information. Estrogen levels decline as a woman's body prepares for menopause; this affects the way the brain functions, causing lapses in memory known as brain fogs. Consuming alcohol at a faster rate than the body can metabolize, it usually leads to intoxication, which can affect the brain's ability to form new memories. Once sober, a person may not be able to recall details or entire events they experienced once intoxicated. This is known as a blackout. The long-term consumption of alcohol will hinder the functionality of the brain, and cause memory lapses to occur more frequently. It can be difficult to know at what point to take your memory lapses seriously, as it is not an obvious symptom in the way that a rash or weight change would be. If you suspect you are experiencing difficulties with memory, processing and retrieving new information, or concentrating for long periods of time, take note of specific incidents of these, and keep an eye out for other concerning symptoms, so you can work with your doctor to diagnose and treat the cause of your memory lapses efficiently, if necessary.